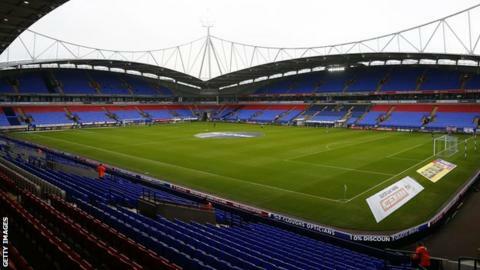 Bolton Wanderers' players say they have been left in an "impossible position" after claiming they have gone on strike over unpaid wages and bonuses. The Championship club's friendly at St Mirren on Saturday has been called off, with the Scottish Premiership side saying it was out of their control. In a statement issued to the Bolton News, the squad said their treatment by the club was "totally unacceptable". Bolton beat Nottingham Forest on the final day of last season to stay up. Bolton, who have been contacted for a response by BBC Radio Manchester, confirmed that the game at St Mirren was off. "The football club would like to apologise for any inconvenience this will cause," it said. The squad statement said: "Over the past two seasons we as a club have experienced unprecedented success in first achieving promotion to the Championship, then staying in the league last season. "This was achieved despite extremely difficult circumstances. All players, current and past, who were contracted to the club have contributed to this success. "Over the course of the two years, on numerous occasions contracted players have not been paid on time. This has culminated in certain players not receiving their June wage. "On each occasion this has happened we have received no notification or an explanation as to why. We feel this is totally unacceptable after a huge effort from everybody over the last two seasons. "Regrettably, as a group, this has led to the decision. We unreservedly apologise to any supporters that have made plans to come and watch the game." Bolton have had financial difficulties in recent seasons and had a winding-up petition against the club dismissed in February after they paid an outstanding debt to HM Revenue & Customs.